I have to admit, I am probably the biggest fail of nail blogger when it comes to indies. I have tried so very few, and find it really difficult to keep up with all that's out there. When holidays come around with sales I usually take that opportunity to try a new indie. This past Memorial Dale during sale I came across The Lady Varnishes, and decided to gives these polishes try. This one I picked out is a real stunner. 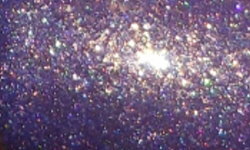 Lilac is a bright lavender foil varnish with holo pigment and gold to green color-shifting shimmer. Color: This combines my one of my favorite color combos which of course makes it amazing. I absolutely love cool-toned colors with gold. The golden shimmery glow this lavender holo has is beautiful! I love the softness of this color, but I love even more how the shimmer and holo effect enhance it. Sometimes I notice with lighter colors, holo and shimmer can drown out the base color. This color is pigmented and saturated. Formula: Outstanding formula. I was so so so impressed. I only needed 2 coats, and this applied so smoothly and opaquely. Price: This is $12.00 on The Lady Varnishes etsy site. Overall: I'm in love with Lilac. This is a beautiful holographic polish with that really stands out as extra special. The formula on this is superb and applied beautifully. I'm very happy with this indie and this purchase! Gorgeous! I love indie polishes but there are so many it's impossible to keep. I'll will definitely have to check out her store! I third about the Indies. There seems to be a new one starting up every week. Like you, I try to wait for sales. Their price point generally is what gets in my way otherwise . Two of my favorite ETSYs are Signet Nails and Literary Lacquer.